Options abound on this simple and beautiful hike for the budding backpacker. Water Availability: The Lakeshore Trail dips to lake level regularly and the lake water is cold and clean. Getting there: From the town of Chelan drive to Fields Point and take the ferry to eit wher Prince Creek, Moore Point or Stehekin Landing, depending on how long of a trip you are planning. Know-before-you-go: Permits are not required to camp at the boat in camps listed here. There are three campgrounds in Stehekin that all require free permits. Sky Above and Below: The Lakeshore Trail offers up breathtaking views from the dry northeastern banks of Lake Chelan. This hike takes you along the hot and dry Lakeshore Trail to see sweeping vistas of Lake Chelan and the surrounding mountains. All three options take you to Moore Point, a wide and flat peninsula that reaches out into Lake Chelan and offers breathtaking views up the Lake to the snowy Cascades and down the lake to the dry grasslands in their rain shadow. Option 1: Take the ferry to Prince Creek, the furthest of the camps from Stehekin, and hike northwest 18 miles to Stehekin Landing, camping at Moore Point along the way. Option 2: Take the ferry to Moore Point and hike just the most spectacular section of the Lakeshore Trail, the seven miles between there and Stehekin Landing. This can be done as a day hike or broken into two days by spending a night halfway at quiet Flick Creek camp. 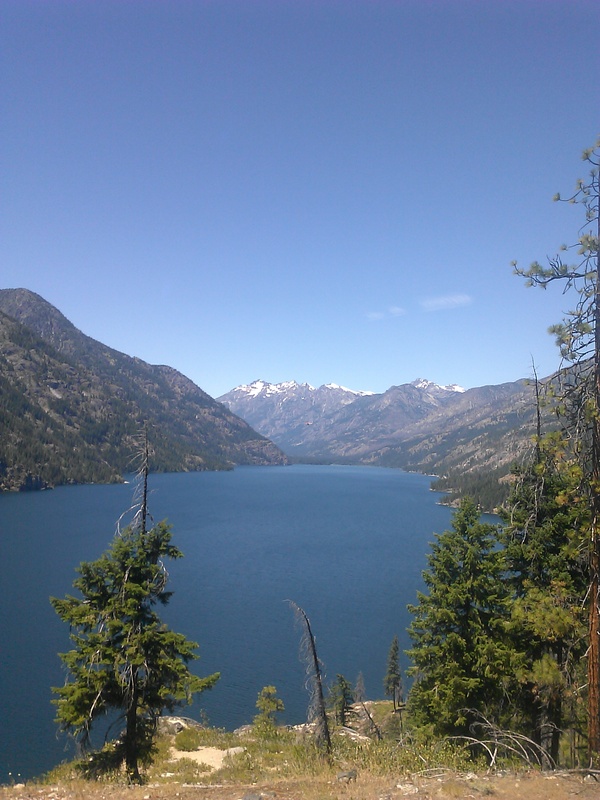 Option 3: Take the ferry (or hike in from elsewhere in the Park) to Stehekin, then pickup the Lakeshore Trail from the Golden West Visitors Center and hike southwest to your heart’s content. There are several camps along the way. At the end either turn around and return the way you came, or arrange ahead of time for the ferry to pick you up at Prince Creek. More information available from the North Cascades National Park website or in person at the Golden West Visitors Center in Stehekin. Stehekin is mile 2580 of the PCT. Author’s Experience: I took option 3, a down and back to Moore Point, while resupplying in Stehekin during my PCT through hike. This entry was posted in backpacking, cascades, hiking, national parks, Pacific Crest Trail, Washington state by Kyle. Bookmark the permalink.